I like Salvia clevelandii for its foliage fragrance more than all else. But there is a lot of other stuff to like about the Cleveland Sage. 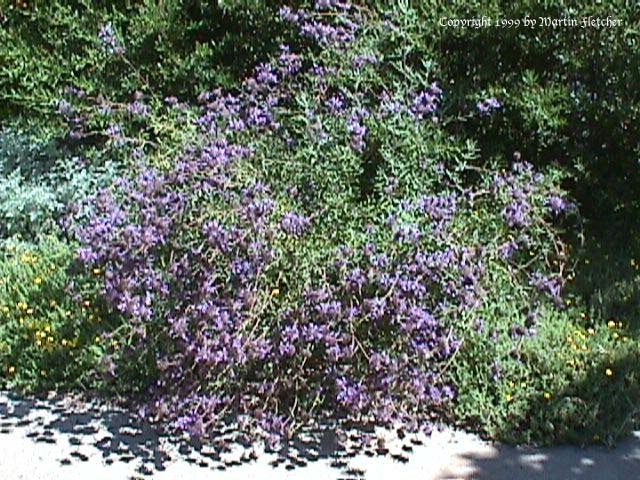 This Fragrant Sage blooms from Spring through to late Fall and is often covered in blue flowers, though it is a little anemic during the Summer. The leaves have an interesting pebbled texture and fit into the gray garden well. Salvia clevelandii gets to 3-4 feet tall and will continue to spread up to 6 feet or more if in a robust environment. But Salvia clevelandii can readily be kept smaller. The Winifred Gilman - Cleveland Sage flowers are a dark lavender purple. I prune off the old flowers to keep the plants blooming and looking fresh. Salvia clevelandii is a nectar source for the Painted Lady, Mournful Duskywing and the California Dogface Butterfly, Cloudless Sulfur and the Northern White Skipper and is a great plant for the butterfly garden or the hummingbird garden. High resolution photos of Salvia clevelandii are part of our garden image collection.